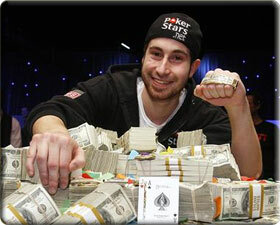 Jonathan Duhamel bested a tough final table to take the 2010 WSOP main event title and nearly 9 million dollars. His road to victory was not an easy one, however. The final table featured several highly skilled pros and saw over twenty chip lead changes before the action finally came down to heads up between Jonathan Duhamel and John Racener. Johnathan is 23 years old and lives in Montreal. An amazing rivered straight bested Matt Affleck’s pocket aces for a 42 million chip pot that sent a stunned Affleck to the rail in 15th place and propelled Duhamel to the final table on cruise control with a commanding chip lead. The final table was not an easy battle for Duhamel, especially after fan favorite and long time pro Michael “The Grinder” Mizrachi took the cheap lead. Both known for a fairly aggressive style of play, these two clashed until Duhamel finally sent Mizrachi out. When the action reached the final three players it seemed a foregone conclusion that the heads up battle to end the tournament would be between Duhamel and the skilled Joseph Cheong from California. John Racener at this point had an abysmally short stack. During this time, Cheong and Duhamel continued to clash in several big pots as Racener folded to stay out of the way. The solidly skilled Cheong seemed to blow up under the pressure of making it to a heads up match with Duhamel and was sent to the rail with a questionable call. Duhamel easily won the heads up match holding a 6 to 1 chip lead that Racener simply couldn’t surmount, bringing Canada home it’s first WSOP championship.